10 Phrygia, Pamphylia, Egypt, and the areas of Libya toward Cyrene, visitors from Rome (both Jews and converts to Judaism), 11 Cretans, and Arabians. And we all hear these people speaking in our own languages about the wonderful things God has done!” 12 They stood there amazed and perplexed. “What can this mean?” they asked each other. 13 But others in the crowd were mocking. “They’re drunk, that’s all!” they said. A little further on in this chapter (verse 15) Simon/Peter addresses a crowd & states that it is 9am in the morning. So this scene must be a few seconds before that. There is simple, one directional lighting in this scene, coming from the early morning sunshine, to the right of the scene (in the East) which is breaking through the storm clouds. 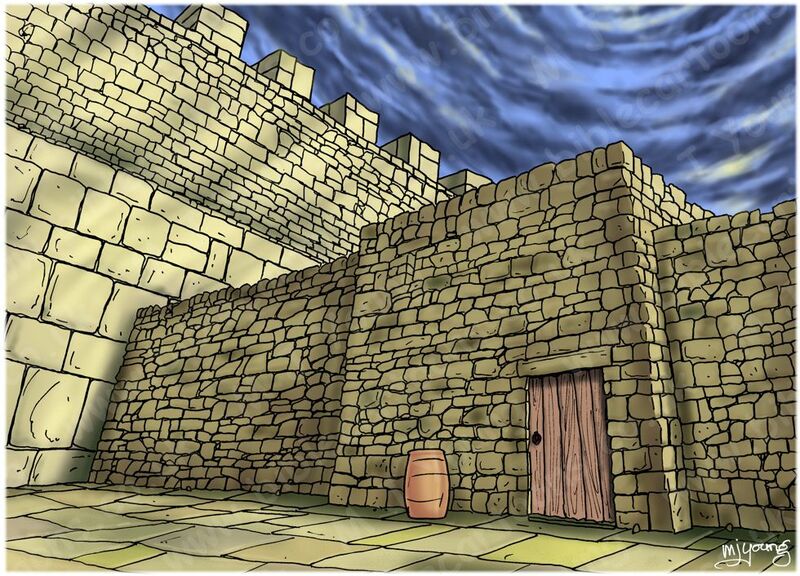 A number of Jewish people, having arrived at the base of the building, on whose rooftop we can see Simon/Peter & the rest of the apostles/disciples. 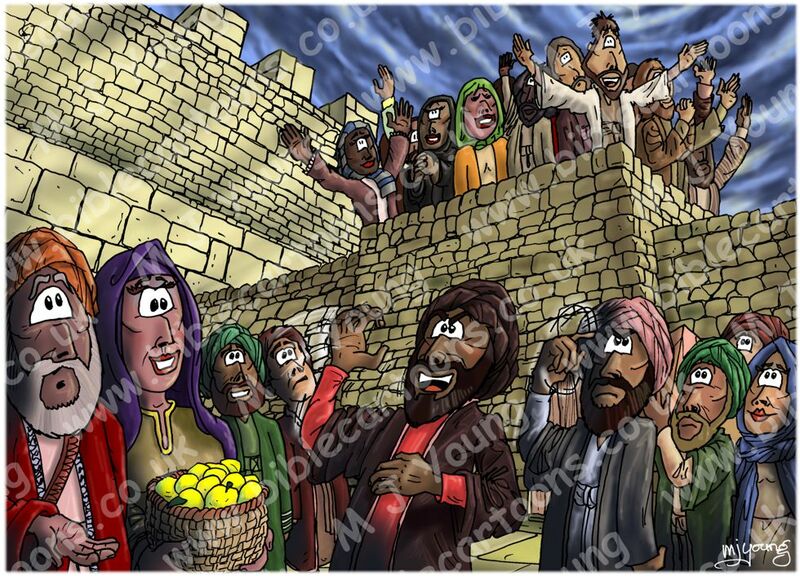 We can see many of Jesus’ disciples in this scene, standing on the rooftop. Many of the characters depicted here are the same ones you can see in several of the previous scenes. In the foreground (on ground level) there are various people – probably going to/from market or businesses. 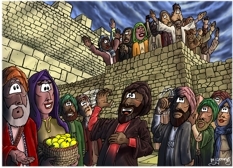 I draw your attention to the two men in the middle, who are indicating that they believe the apostles/disciples have been drinking (the man in red/brown), &/or are mad (the man in grey/blue), judging by their hand gestures! Other members of the crowd are either bemused, surprised, mystified, or else laughing at the 2 men’s gestures! We know that this was a very important time for the early Christian church: the sending of the Holy Spirit upon the believers.